Jesse and Rhonda Denison both accepted Jesus Christ as their personal Lord and Savior at a young age. God led them both to Mesa State College (now CMU) where they became involved with Master Plan Ministries. They witnessed genuine Christian fellowship, faith in action, and received sound discipleship. Jesse participated in a summer project with Keynote, the music ministry of Campus Crusade for Christ. Rhonda went on a summer project to East Asia with Master Plan Ministries. These summer projects helped to confirm that God was leading them into full-time ministry. They also knew that God was leading them together and they were married in 2003. 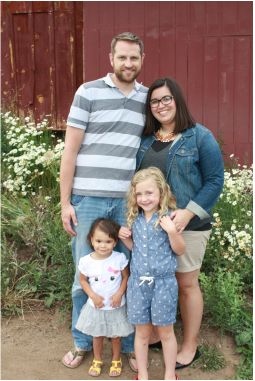 After seeking the Lord, they were led back to Master Plan Ministries to join the campus ministry at Mesa State College. They were accepted on staff in 2005, finished raising their financial support in January 2007, and are currently in their sixth year of full time campus ministry. They have two beautiful daughters, Shelby and Amelia. Jesse studied both Music and Computer Science in his time at Mesa State (CMU). He is excited to see how God is using his skills in music and computers to reach students for Christ. He hopes to expand his knowledge of video production and website design to come up with creative ways to reach students. Although some of his focus is on the technical side of the ministry, he feels a more vital need for expanding the men’s ministry and one-on-one discipleship. Rhonda attended Oklahoma Baptist University for two years until she felt called to reach out to a secular campus. She then transferred to Mesa State where she graduated in 2004 with a B.A. in Counseling Psychology. Rhonda has a passion for reaching out to young women. God has a purpose and design for who he wants Godly women to be, and Rhonda is excited about helping women find freedom and joy in His purpose. Give to the Denison's ministry securely online using your credit or debit card by clicking the "Donate" button above. This will take you to our Paypal giving page. All gifts to Master Plan are tax deductible. You will have the option to make a single donation or designate your gift amount as a recurring donation charged to your card each month in whatever amount you choose. On our Paypal giving page, you may log into your Paypal account before you submit your gift. This will enable you to adjust any recurring gifts through the Paypal website should the need arise in the future. If you don't have a Paypal account, you will be able to make a gift as a guest.